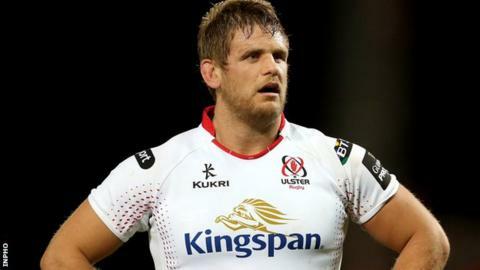 Fit-again Ulster flanker Chris Henry says it would be "an amazing feeling" to be recalled to the Ireland squad during the Six Nations. Henry is expected to play for Ulster against the Scarlets this weekend after a lengthy spell out with a shoulder injury. The openside hopes to force his way into Ireland reckoning after Sean O'Brien suffered a hamstring injury against France on Saturday. "There may be enough time to have some Six Nations involvement," said Henry. Defending champions Ireland play England at Twickenham on 27 February. Henry, 31, admits he's not yet "battle-hardened" for international duty but his chances of being called up have been boosted after O'Brien was ruled out of the England clash. "I don't know how long Sean is going to be out for, but if there's a thing about Joe Schmidt, he rewards people who he trusts that haven't let him down," he said. "Tommy O'Donnell hasn't let Joe down, and Rhys Ruddock hasn't let Joe down, but I hope that he knows I've done a job for him in the past and I'm still there. "It would be an amazing feeling to get back involved with Ireland at some stage." Henry started every one of Ireland's games in the Six Nations championship-winning season two years ago. He was sidelined last year after having heart surgery, as a result of a blocked blood vessel. He came on as a replacement for Sean Reidy in Friday night's Pro12 win over Glasgow and is now poised to start having finally recovered from the shoulder injury he picked up against Toulouse in mid-December. Henry added: "It's been a frustrating enough injury, one that has lingered, and now I have to try and get as much game-time as I can. "I'm not battle hardened. In my position, you need to be in the mix and have those bumps and bruises. "You can't just throw yourself back in but I'd love to think Joe is watching the (Scarlets) game on Sunday."